Monsoon III storm time-lapse video by photographer Mike Olbinski. I’ve never gone storm chasing. Where I live in Colorado I hardly need to; in many cases I just have to sit tight and watch them chase me. But I wonder. Mike Olbinski is a photographer who takes astonishing pictures of storms, and his time-lapse animations are beyond gorgeous. His latest, Monsoon III, is ample proof. You know the drill: Set it to high resolution, make it full screen, and turn your volume up. 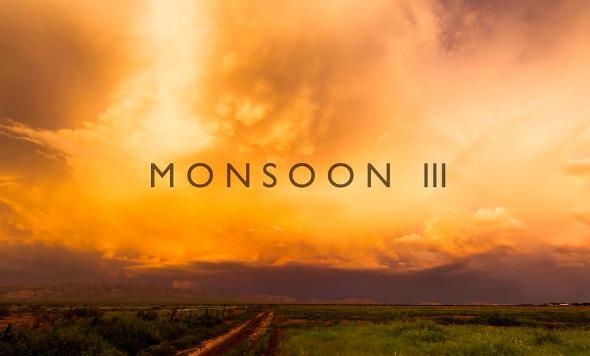 Monsoon III (4K) from Mike Olbinski on Vimeo. He shot that in the summer of 2016 over the course of about 36 days, and took—get this—85,000 frames. A lot of it was shot in 8k, and I can only imagine what this must look like in full resolution. To create a summer monsoon, first sunlight warms the land. Then the air above it gets warmed so it rises and expands, turning into a low pressure system. Moisture-laden air from the oceans sweeps in, lifts up, condenses, and storms form. But that hardly describes the intensity and fierce beauty seen in Olbinski’s video. I was particularly impressed with the haboobs—the walls of dust blown outward from below the storm. These form when there’s a big downdraft from the storm cloud (like a microburst, when falling rain evaporates and cools the air around it, which gets denser and falls rapidly; when it hits the ground, it spreads outward like an enormous splash and can be incredibly powerful. This picks up sand and dust, blasting it outward. The size and scale of a haboob can be enormous. I’ve never seen one in person, but then, I’d maybe rather not anyway. Yikes. It’s also amazing to see how focused the rainfall can be sometimes even when the cloud is sprawled out over a large area. The interaction of heat, air, and water produces unusual and unexpected results … at least, unexpected to me, a novice and amateur cloud watcher. It’s also a strong reminder that the air around us is a fluid; literally, it can flow. Watching clouds and storms like these in person, the action is distant and slow. But in time-lapse videos, that motion can be seen, and the air itself looks and behaves exactly like the fluid it is. And finally, I have to note how magnificent the music is. I love it when the video is edited to match the feel and cadence of the music, as Olbinksi did to Kerry Muzzey’s “Revenge / Revenge Epilogue.” It adds a depth that gives more than its share of power to the footage. My thanks to Mike for letting me know about his amazing video. If you like it, check out his others like Vorticity, Monsoon II, and a jaw-dropping supercell forming over Texas.